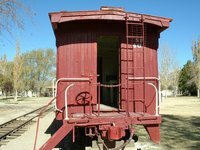 A railroad car would be a great site for a hobo party. During the great depression, homeless men took to the rails, living the life of the vagabond, looking for work or begging. Residing along the train tracks, where they hopped the freight to take a free ride on the railroad car to their next destination, the hobo became an iconic and mysterious image that for some symbolized an adventurous and free spirit. Images of hobos were captured on canvases, in sculptures, and as characters in comedic routines. Today, the hobo can be the inspiration for a theme party, where the guests come dressed as hobos. Pay close attention to how you serve your hobo party food, an essential decorating element to your hobo party. Traditionally, hobos are thought to be vagabonds on the go, carrying little with them in the way of cooking utensils or houseware items. Instead of dishes, collect an assortment of cans for serving food, but avoid any with sharp edges that can cut. Visit a secondhand store and pick up an array of old coffee mugs, plates and silverware. Nothing should match, and chipped plates and mugs are a plus. Hold the party outside, during the evening. Collect some old lanterns for lighting, with a bonfire a centerpiece to the décor. Iconic hobo fires were made in a large metal drum. If you build a real fire, follow safe fire practices and make sure there is a safe distance between partygoers and the fire. Loose clothing worn as hobo attire may be flammable, and if there is drinking at the party, play it safe. Hang a string clothesline in the party area, and use some old-fashioned wooden clothespins to hang up a pair of holey socks or a tattered shirt or two. If there are at least two trees in the yard, fasten the clothesline from one tree to the other. Leave a few hobo bags strategically placed. To make a hobo bag, stuff a red bandana with a towel, pull up the four corners to make a bag, and secure it on the end of a long stick. Because hobo camps were normally located close to the rails, make a railroad crossing sign from cardboard.